Whatever your hot water requirements, we've the innovative answer. Steam and water mixers plus a full washdown range including waterguns and lances, self-retracting hoses, hot-and-cold water mixing valves and couplings. There are stainless steel options for the ultimate in hygiene. Everything for both high and low pressure applications. The core of our range is the Dynafluid 2000 steam and water mixing valve. This product has built a solid international reputation for leadership over a 40-year history and a programme of continued improvement will ensure that this leadership is maintained. Self-retracting reels improve hygiene, enhance employee safety and prolong hose life. 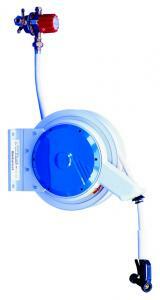 Can be wall or ceiling mounted, and an optional pivoting bracket lets the reel follow the operators movements. Pivot also allows the reel to be folded back to the wall when not on use. Hoses are food and dairy quality, made from white EPDM with cord ply reinforcement. 20m of ½" bore hose or 15m of ¾" bore hose. Floor, wall or ceiling mounted. Dynafluid 2000 Steam and Water Mixing Valve and rubber covered, bronze bodied watergun - see relevent datasheets for more details. 15m of ¾" bore hose. Dynafluid 2000 stainless steel Steam and Water Mixing Valve and rubber covered, stainless steel bodied watergun - see relevent datasheets for more details.